The sun shines on the peak of Mount Everest in this October 2011 photo. 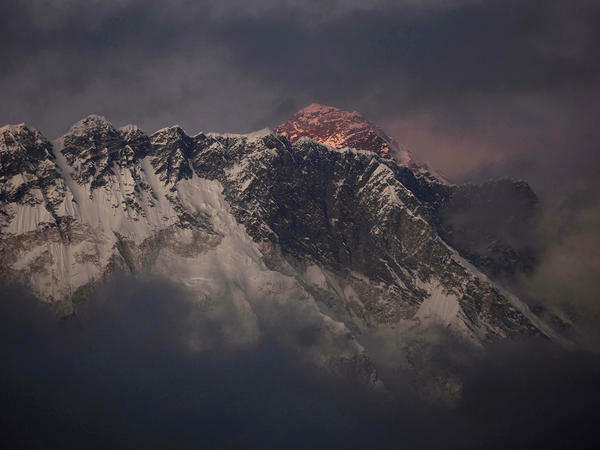 On Friday, an avalanche swept away 16 Sherpas. Whether there will or won't be any expeditions to the summit this year became an issue Friday when an avalanche buried 16 Sherpas who were working to set up ropes and make other preparations for the expeditions that employ them. Thirteen bodies were recovered. The other three Sherpas are missing and presumed dead. It was the deadliest day ever recorded on Everest. Other Sherpas began discussing a boycott, both out of respect for those who were killed and to press for better insurance, larger payments to the families of those who were killed and other demands. The Nepalese government agreed to some of the requests, but many of the Sherpas are said to be unhappy with the response.